Edward J. Kata, MD is a board-certified urologist who focuses on laparoscopic and robotic surgery, urologic oncology and the treatment of urinary incontinence and kidney diseases. 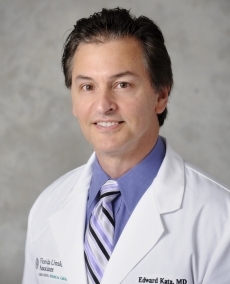 He is a noted clinician and researcher with advanced training a in minimally invasive laparoscopic and robotic-assisted surgery, and he specializes in helping patients who are experiencing kidney disease, urinary incontinence and other complex urological issues. Dr. Kata received his medical degree from the University of Vermont College of Medicine and completed his residency training in urology and general surgery at SUNY Health Science Center in Brooklyn. Note:- The list below is for reference purposes only and is subject to change. Please check with your health plan to confirm that Edward Kata, MD is included before scheduling an appointment.